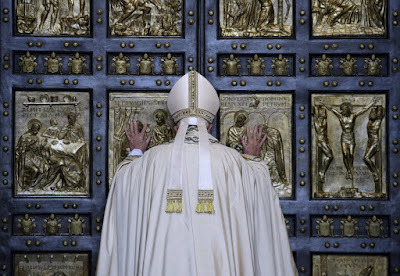 Whispers in the Loggia: "Jesus Wishes To Throw Open Our Closed Doors" – On Mercy Sunday, The Pope's Coming "Gospel"
"Jesus Wishes To Throw Open Our Closed Doors" – On Mercy Sunday, The Pope's Coming "Gospel"
At least in the minds of many, with Friday's release of Amoris laetitia ("The Joy of Love") – the all-important, hysterically-anticipated Apostolic Exhortation closing out the twin Synods on the Family – the Pope faces the most consequential moment to date of his three-year reign. Keeping in mind that the news and a circus are two very different things, more of the former in due course. In the meantime, it is significant that – even for the ongoing Jubilee Year dedicated to the mercy of God – the imminent frame for the sprawling text's rollout is today's observance of Divine Mercy Sunday, the feast added to this liturgical date by John Paul II to honor the 20th century devotion born from the visions of St Faustina Kowalska: a cause which the Polish Pope intensely sought to integrate into the mainstream of Catholic life, and largely succeeded. 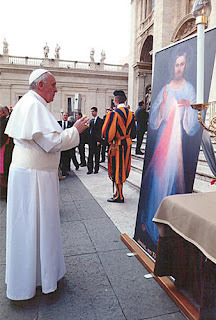 In light of the feast, this weekend brought the Vatican's Jubilee event focused on Faustina's message from the merciful Jesus, with Francis himself leading a vigil in St Peter's Square last night – likewise the 11th anniversary of John Paul's death – and an outdoor Mass this morning. Sticking to his usual practice, while the Pope's homily at today's Mass kept a surface focus on this Sunday's Gospel – the Risen Christ's encounter with Thomas, one of the few texts assigned across the three-year lectionary cycle – the striking five-paragraph preach can be viewed as an interpretive key behind the contents of Amoris, and even Francis' unofficial "curtain-raiser" to the coming document. “Jesus did many other signs in the presence of the disciples, which are not written in this book” (Jn 20:30). The Gospel is the book of God’s mercy, to be read and reread, because everything that Jesus said and did is an expression of the Father’s mercy. Not everything, however, was written down; the Gospel of mercy remains an open book, in which the signs of Christ’s disciples – concrete acts of love and the best witness to mercy – continue to be written. We are all called to become living writers of the Gospel, heralds of the Good News to all men and women of today. We do this by practicing the corporal and spiritual works of mercy, which are the hallmarks of the Christian life. By means of these simple yet powerful gestures, even when unseen, we can accompany the needy, bringing God’s tenderness and consolation. Thus continues the great work of Jesus on Easter day, when he poured into the hearts of his fearful disciples the Father’s mercy, bringing them the Holy Spirit who forgives sins and bestows joy. At the same time, the story we have just heard presents an evident contrast: there is the fear of the disciples, who gathered behind closed doors; and then there is the mission of Jesus, who sends them into the world to proclaim the message of forgiveness. This contrast may also be present in us, experienced as an interior struggle between a closed heart and the call of love to open doors closed by sin. It is a call that frees us to go out of ourselves. 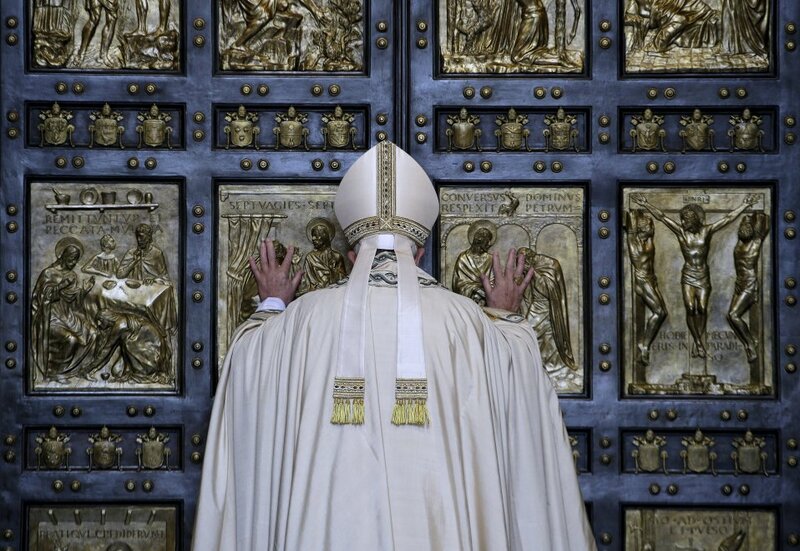 Christ, who for love entered through doors barred by sin, death and the powers of hell, wants to enter into each one of us to break open the locked doors of our hearts. Jesus, who by his resurrection has overcome the fear and dread which imprison us, wishes to throw open our closed doors and send us out. The path that the Risen Master shows us is a one way street, it goes in only one direction: this means that we must move beyond ourselves to witness to the healing power of love that has conquered us. We see before us a humanity that is often wounded and fearful, a humanity that bears the scars of pain and uncertainty. Before the anguished cry for mercy and peace, we hear Jesus’ inspiring invitation: “As the Father has sent me, even so I send you” (Jn 20:21). In the responsorial Psalm we heard these words: “His love endures forever” (Ps 117/118:2). Truly, God’s mercy is forever; it never ends, it never runs out, it never gives up when faced with closed doors, and it never tires. In this forever we find strength in moments of trial and weakness because we are sure that God does not abandon us. He remains with us forever. Let us give thanks for so great a love, which we find impossible to grasp; it is immense! Let us pray for the grace to never grow tired of drawing from the well of the Father’s mercy and bringing it to the world. Let us ask that we too may be merciful, to spread the power of the Gospel everywhere, and to write those pages of the Gospel which John the Apostle did not write.